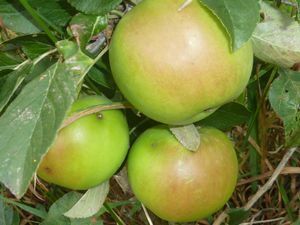 James Grieve - Cooking Apple Tree £12.75 - Cooking Apples - Early Season Apple Trees and Fruit Trees For Sale. Buy at competitive prices with wholesale discounts. This is an excellent variety. 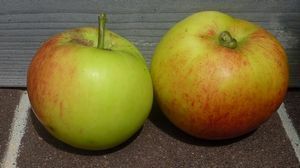 It was raised in Scotland in 1893 by Mr. James Grieve and it remains a very popular dual purpose dessert/cooking apple. When used earlier in the season, from late July through August, it can be used for cooking, making a sweet and delicate stewed apple. By mid September/early October it can be eaten as a dessert fruit, having a wonderful balance of sweetness and acidity from its crisp yet melting flesh. It is easy to grow, hardy, spurs freely and gives good crops, making it an excellent garden variety.